Once I figured out the appropriate process for Lemonade Pie, it was time to play around. Why not guava? It works too, but strawberry-guava concentrate is much sweeter than lemonade concentrate. Adding lemon juice brings the recipe up up to 5 ingredients and cuts down the heavy sweetness and brings out the guava's brightness better. But like its cousin, the result is well-worth the minimal effort and freezer space. Mix strawberry-guava concentrate and condensed milk. Add the juice of the first lemon and stir well. If it's still too sweet, add the second lemon. Fold in Cool Whip. Dump into the graham cracker crust tarts and freeze. 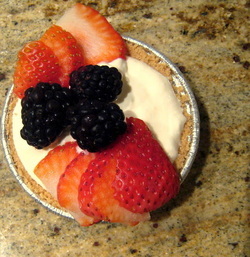 Right before serving, top with your favorite berries.